Remove the metal objects worn on your body before you use the metal detector. Make the targets 2-3 inches away from the probe disk and slowly sweep parallel to the ground. If you are working on a lawn, gently push it close to the lawn. The probe disk can work in shallow water. Package include: A metal detector and a product instruction. 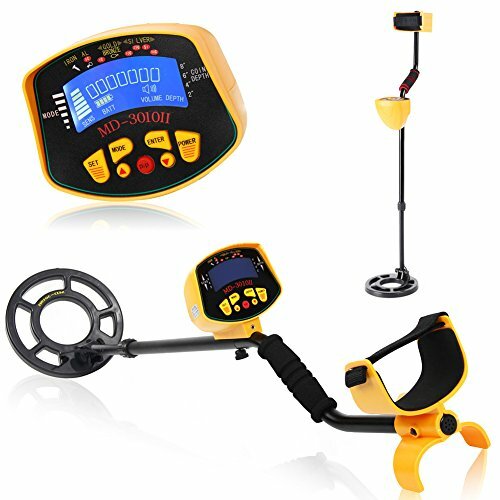 Best choice metal detector for beginners,universal,easy use and convenient. You could research Coins,watch,rings, ruins, jewelry, gold and silver ornaments, people use it as a treasure finder. High accuracy and high sensitivity-Popular for outdoor explorer, archaeologist,treasure hunter. Newly digital metal detector-it comes with waterproof detection dial, pointer display,built-in speaker,earphone jack and adjustable handle. It can be used in shallow water area and underground place, widely use in security check,archeology,prospecting treasure hunt,metal detect, etc.